As a UX designer and part-time anthropologist, working at ScraperWiki is an awesome opportunity to meet the whole gamut of hackers, programmers and data geeks. Inside of ScraperWiki itself, I’m surrounded by guys who started programming almost before they could walk. But right at the other end, there are sales and support staff who only came to code and data tangentially, and are slowly, almost subconsciously, working their way up what I jokingly refer to as Zappia’s Hierarchy of (Programmer) Self-Actualisation™. The Hierarchy started life as a visual aid. The ScraperWiki office, just over a year ago, was deep in conversation about the people who’d attended our recent events in the US. How did they come to code and data? And when did they start calling themselves “programmers” (if at all)? To a non-programmer, it might seem like a barrage of crazy acronyms and impossible syntaxes. But, trust me, the hardest part was way back in the beginning. Progressing from a point where websites are just like posters you look at (with no idea how they work underneath) to a point where you understand the concepts of structured HTML markup and CSS styling, is the first gigantic jump. Or a video game, or a newspaper. We’re not used to interrogating the very fabric of the media we consume, let alone hacking and tweaking it. Which is a shame, because once you know even just a little bit about how a web page is structured, or how those cat videos actually get to your computer screen, you start noticing solutions to problems you never knew existed. Making that jump – for example, realising that the dollar symbol in $('span').fadeIn() is just a function – took me a while, but once I’d done it, I was a programmer. I didn’t call myself a programmer (in fact, I still don’t) but truth is, by that point, I was. Every problem in my life became a thing to be solved using code. And every new problem gave me an excuse to learn a new function, a new module, a new language. David, ScraperWiki’s First Engineer, sitting next to me, took a completely different route to programming – maths, physics, computer science. So did Francis, Chris and Dragon. Zach, our community manager, came at it from an angle I’d never even considered before – linguistics, linked data, Natural Language Processing. Lots of our users discover code via journalism, or science, or politics. 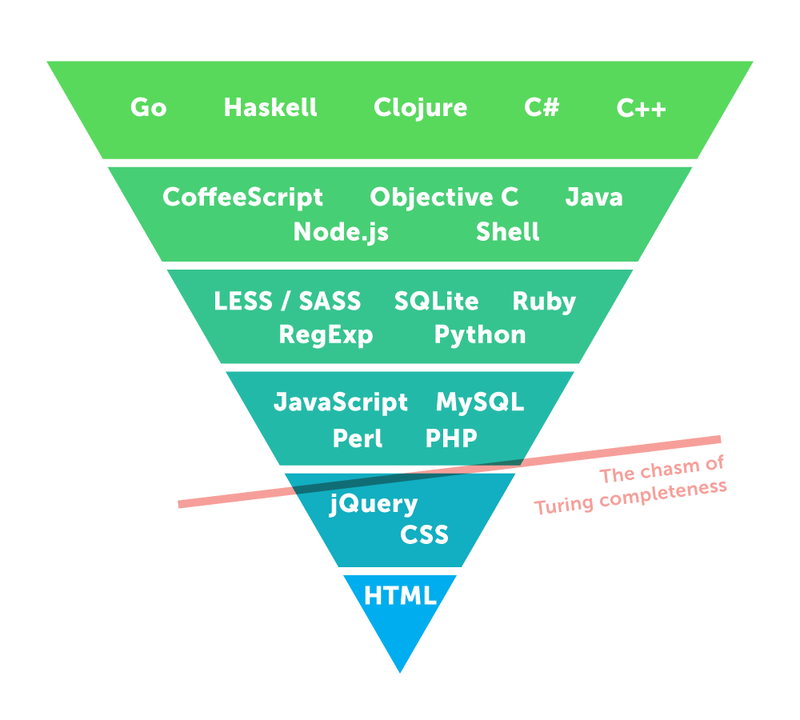 I’d love to see their versions of the hierarchy. Would David’s have lambda calculus somewhere near the bottom, instead of HTML and CSS? Would Zach’s have Discourse Analysis? The mind boggles, but the end result is the same. The further you get up the Hierarchy, the more your brain gets rewired. You start to think like a programmer. You think in terms of small, repeatable functions, extensible modules and structured data storage. How about you? What was your path to where you are now? What does your Hierarchy look like? Let me know in the comments, or on Twitter @zarino and @ScraperWiki.